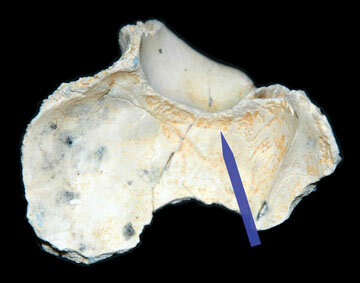 The stylus indicates tiny lesions behind the right eye orbit on a Homo erectus skull. Half a million years ago, a young man died in a valley near what is now the Turkish village of Kocabaş. Anthropologists, who found tell-tale lesions on a fragment of his skull, say a rare form of tuberculosis (TB) may have led to his demise. If the diagnosis is correct, the skull represents evidence of the earliest known case of human TB as well as the only case ever found in an extinct hominid. Until a few years ago, most infectious disease experts thought that the human form of TB originated some 8,000 years ago when people began domesticating cattle, which carry a bovine form of the disease that can also infect humans. The oldest confirmed cases of human TB come from Egyptian and Peruvian mummies that are a few thousand years old. But recent molecular evidence suggests that the bacterial strain that gave rise to the human form of the disease is nearly 3 million years old. The Kocabaş fossil could support this hypothesis. TB is caused by rod-shaped bacteria that pass from person to person on tiny droplets of mucus that become airborne when a person coughs or sneezes. The smallest of these bacteria-laden droplets can make their way deep into another person’s lungs and cause infection. Severe infections prompt the immune system to send masses of specialized immune cells to the scene, where they attempt to quarantine TB-causing bacteria. This hard lump of bacteria and immune cells is known as a tubercle. In fact, the marks in the Kocabaş skull are similar to marks found inside the cranium of a European man who died of this form of tuberculosis in 1877. “If you put them side by side you can’t tell the difference,” Kappelman says. “I think they’ve made a good case,” says Clark Larsen, an anthropologist who is an expert in skeletal biology at Ohio State University in Columbus and was editor-in-chief of the American Journal of Physical Anthropology at the time the paper was accepted for publication. Donald Ortner, a biological anthropologist at the Smithsonian Institution in Washington, D.C., however, is skeptical. He says TB is just one possibility. “I would have been a little more equivocal,” he says. “A lot of other things form lumps of tissue that can result in these sorts of depressions besides [TB] infection,” including viral meningitis. Kappelman and his colleagues plan to scour the quarry, but finding other pieces of the skull may prove difficult. Turkey exports travertine all over the world. “It’s possible that it’s already on some home-improvement store shelf,” Kappelman says.